The Hotel King , 3 stars of Milano Marittima, managed by the Azzurro Club Vacanze, has a large garden and a swimming pool with Jacuzzi for children and equipped solarium area, as well as: WI-FI Internet connection, enclosed parking, bicycles free use and many entertainment proposals and theme nights. Accepts pets of all sizes. The hotel is located in Milano Marittima in the "Anello del Pino", a quiet and equipped green area, surrounded by pine trees. From the hotel you can access the nearby beach without having to cross roads. The center of Milano Marittima can be reached on foot or by bike in a few minutes. All rooms are equipped with balcony, air conditioning, telephone, WI-FI and private bathroom with shower and hairdryer. COMFORT : in addition to the features already listed are equipped with digital terrestrial TV. FAMILY COMFORT : on the top floor of the structure, consisting of two connecting rooms with digital terrestrial TV, each with its own balcony but with a single bathroom. EXCLUSIVE : LCD TV with Sky and Pay per view, PC with wired internet connection, minibar, beds with Simmons mattresses, safe, shoe rack, iron and ironing board, King bathrobe. Equipped garden, swimming pool, hydromassage and solarium, free bicycles, reading room with newspapers, comfortable hall, TV room, bar, lift, beach towels available. The hotel staff organizes theme nights, shows, entertainment, group activities and sports. PARKING : uncovered, fenced and free. Available for everyone. CONVENTIONS : amusement parks, beach and law enforcement. Free entry to the Atlantica Water Park and the Azzurro Club Village park. BREAKFAST : buffet of freshly prepared desserts every day, pastries and savory dishes. LUNCH AND DINNER : 3 choice menu with meat and fish dishes accompanied by buffet of appetizers, vegetables, fruit and desserts. VARIATIONS : vegetarian and celiac dishes available. OTHER: Romagna party with poolside dessert buffet; chocolate party with chocolate fountain with biscuits and fruit to dip; Paella party with typical Iberian dishes, sangria, nachos, sauces, pizza and chips for the little ones. In the hotel : children's pool, strollers, mini club, live entertainment. At meals : baby menu, baby food, high chairs, afternoon snack. On the beach : mini club and live entertainment. 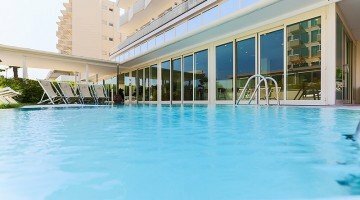 The hotel has a 12 sqm large outdoor salt pool, ideal also for children, equipped with hydromassage jets and equipped solarium area. The hotel has an agreement with the Holiday Village beach, a short walk from the hotel, which offers entertainment, swimming pool, games for the little ones, playgrounds, pilates, yoga and other fitness activities, restaurant, bar and much more . The structure also has an agreement with the Bagno Katia with numerous services for all, catering area, sports fields (basketball, bocce), gym, table tennis, table football, nursery and children's playground area. Prices are per person per day for a minimum stay of 3 nights. - Long vacation: for stays of 14 days, 30% discount. - Stop Prices: booking by the end of the stay, a week of vacation for the following year, you will block the prices of the current price list, you will also be reserved, the 20% discount as advance booking confirming within 15 days with a deposit of 30 %. - Welcome back: for a subsequent stay in the same season, 25% discount. - Special Seniors holiday: 30% discount in the periods from 14/04 to 22/06 and from 25/08 to 30/09, 25% discount in other periods reserved for senior couples (stay in a double room with both occupants of 60 years old). - Special happy couples: up to 30% discount for all couples under 60. - Mini Groups: for groups of minimum 10 adults with full price, 25% discount. - Introduce a friend to us: Become our Partner for a new booking of friends, relatives, colleagues that you will do in your name, you will receive a 25% discount. 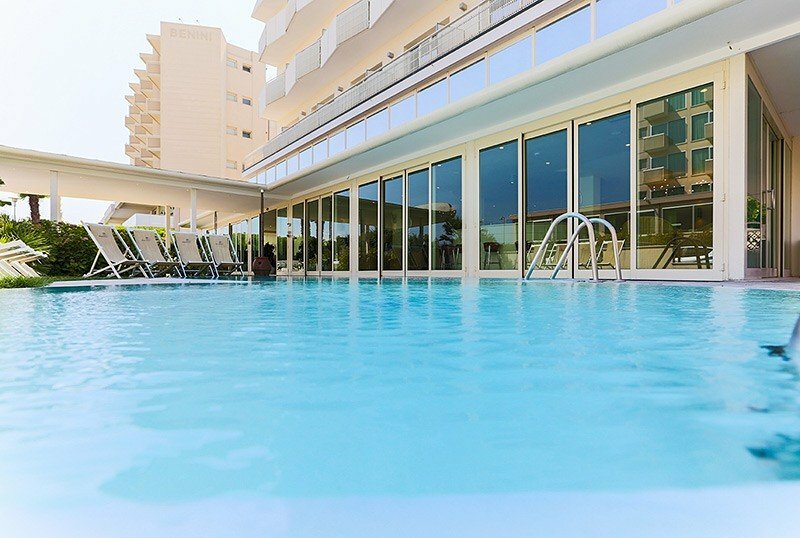 - Azzurro Club Vacanze Check of € 150.00: to be discounted for stays of min. 2 people in the same room. - Platinum Card (not combinable with other offers): 25% discount for Platinum Card holders. The discount is based on daily rates and without a deposit. In case of cancellation of the reservation with less than 24 hours notice before arrival, the customer will still be required to pay a contribution of 20% of the total amount of the confirmation. - Azzurro Card Club (not combinable with other offers): 20% discount for holders of Azzurro Card Club until 2 August and from 24 August and 15% on all other periods. The discount refers to daily rates for a minimum stay of 6 days. - Open Bar with Azzurro Club Vacanze Gift Card: for stays of a minimum of 6 days in the periods indicated, a Gift Card with € 50.00 credit per room is included which can be used for all drinks made at the hotel bar. - 2019 Customer Week: by booking a stay of at least 6 days before September 15th, you will have the right to participate for free in the seventh edition of the Azzurro Client's holiday week which will be held from September 14th to 21st 2019 at all the Romagna facilities. - 100% Booking Bonus: By booking a period of stay between 8 June and 7 September 2019 you will receive a 100% booking bonus transferable to friends and relatives and valid for one person in a double room staying at least 7 days between 4 May and on 8 June 2019 or from 7 to 14 September 2019 in any Azzurro Club structure on the Romagnola Riviera. There is nothing better than a holiday with your partner to find the harmony of a couple, let yourself be pampered by the professionalism of our staff taking advantage of a reduction of up to 30%. Furthermore, Azzurro Club Vacanze has increased the discount for Silver Stays from this year. You can book your holidays taking advantage of the reduction up to 30% on daily rates. Contact us now for a personalized quote. Stays of minimum 14 days: 30% discount.